Florence started school in Reception yesterday and, as you can imagine, I was a tad emotional. I wasn’t worried about her actually going to school, I knew she’d take it all in her stride, and she absolutely did. I think the worry for me is her future. Starting school is a massive, massive step in our lives and it’s at this point I feel our lives really begin to take shape. The friends she makes, the subjects she enjoys and the teachers she has will all lead her on to, hopefully, bigger and better things. I feel slightly out of control now. But, I have been doing some research into ways I can help Florence reach her potential. I don’t want to be a pushy parent, far from it, I want her to discover her own likes and dislikes but I want to give her the tools to do that and guide her. Throughout her preschool years I bought all those educational type books where you match up shapes, trace letters and learn to count but it never really held her interest for longer then 15 minutes. I recently discovered Education Quizzes; a website full of quizzes designed by teachers to help children be successful at school. I know what you’re thinking…..sounds dull right? Wrong! Florence came home from her first day at school and raved about the school having loads of computers and it dawned on me that this is how she will learn. She will use the internet to research whereas I went to the library or asked my parents. She will create work on the computer using various programs whereas I wrote an essay in my jotter pad. 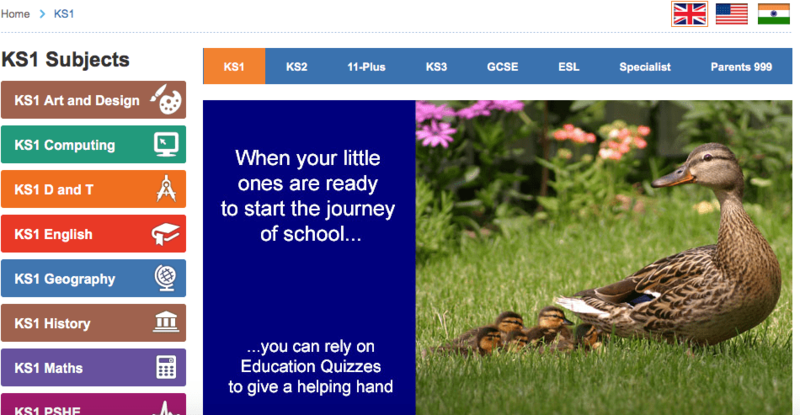 The quizzes are split into key stages, KS1-GCSE, and then by topic. They are fun, interactive and suitable for all children – there’s even an ‘English as a Second Language’ section. It is suggested you spend around 30 minutes a day in a one to one situation with your child working through the various topics. I’ve had a look through the KS1 Education Quizzes with Florence and, despite being in Reception, she was actually able to make a good guess at the answer. It kept her engaged for some time as we discussed the options and I also let her use the computer to navigate the site. She became familiar with the colour coding on the site quickly and remember which topic was associated with which colour. The quizzes are available on a monthly subscription basis at a cost of £9.95 and can be cancelled at any time.